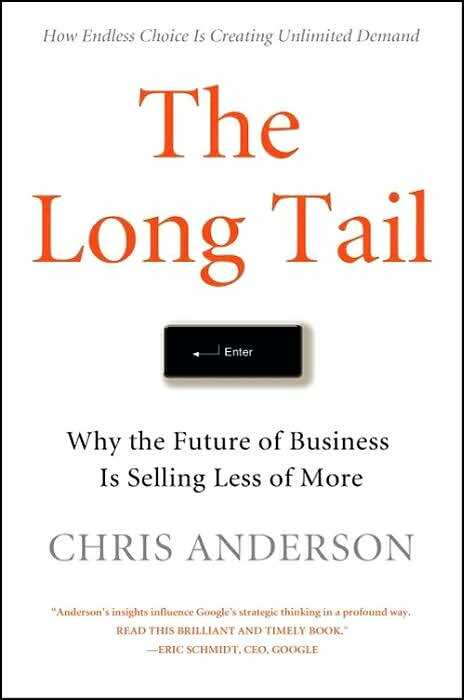 At Amazon.com...a quarter of all book sales come from outside the site's top-one-hundred-thousand best-sellers. This is great news for people who read more than Stephen King novels and listen to music other than U2. And this was the promise of the Internet back in the day, at least vis-a-vis publishing: any book that's been published, any music that's been recorded, speedily delivered to your house in either atoms or bits -- your choice. The article throws a few punches at Anderson's arguments, but I won't recount those here. Read the article your own bad self. So: good review in the New Yorker, interesting thesis and evidence. And, unfortunately, a cover that's as predictable as the sun coming up tomorrow morning, North Koreans be damned. Why are business titles so uninspired? Can someone point one out that's not? Are business titles designed like this because publishers don't think design matters to business readers? And was there no one involved in the production of the book who noticed the awful kerning between the "T" and "a" in "Tail?" I guess there wasn't. 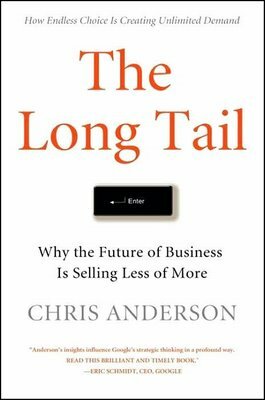 In a sense, you and your blog may constitute a fraction of what Anderson identifies as the "third force" of Long Tail economics: connecting supply and demand by serving as a kind of "tastemaker", thus driving more business from the hits to the niches of the tail. I hope that's not the best example in the book -- that the old paradigm of making 80% of your money fromn 20% of your products is utterly wrong because Amazon makes 75% of their book money from less than 10% of their books (since I know they claim to have at least a million books). The cover, though -- that's about as boring as can be. It screams "I'm a serious business book! Buy me and learn how to leverage your competence!" Andrew: point well taken. There are other examples in the article, which is definitely worth reading. Actually, the kerning is right on the actual cover. I don't know why it looks like that on the jpg. All your other comments about bland book covers are fair comment, however. Blame the Tipping Point for convincing the book industry that simple covers sell! Hi Chris: Thanks for writing in. Always nice to hear from authors! I wish I had the time to always check out the real books at the bookstore, but unfortunately I don't. It's not *too* often that something like this gets posted at Amazon/BN/the publisher site, but it does happen. Good luck w/ the book -- not that you need it, as it's currently #24 at Amazon. Congratulations!